The PreSonus Studio Channel is a professional channel strip combining a Class A tube preamplifier, a VCA-based compressor, and a 3-band parametric equalizer. The Studio Channel is perfect for all levels of studios. Ideal for all types of microphones, instruments, keyboards, and synths, the PreSonus Studio Channel has the sonic power and flexibility to achieve any tone you can dream of, including luscious in-your-face vocals, crystal-clear acoustic guitars, fat, solid bass guitar, dynamic acoustic piano, cracking snare, punchy bass, huge MPC tracks, and more. 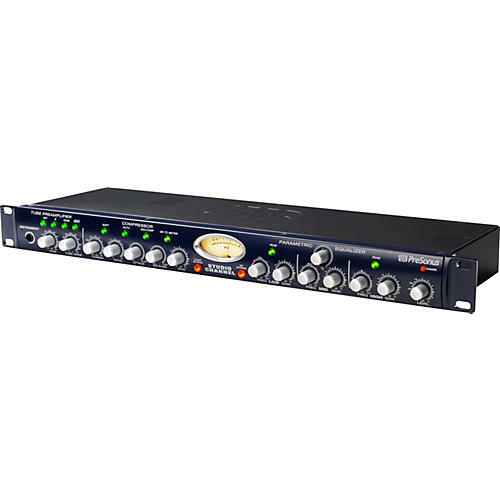 The Presonus Studio Channel was designed to outperform preamplifiers that are built-in to most recording interfaces and affordable mixers. Add a VCA-based compressor and studio-grade equalizer to the class A tube preamp and you get not only big, fat, tube tonality but also complete control of your tone and sounds. Since much of the recording process is accomplished one track at a time, you need a signal path that can deliver a variety of high quality tones and sounds, which is why the Studio Channel is a prime tool for any studio. The Studio Channel has everything needed to deliver big tone. The preamplifier stage of the Studio Channel is based on the award-winning BlueTube preamplifier with a high-output 12AX7 vacuum tube operating on voltages higher than other preamplifiers in its class. It delivers high headroom and big tone. Dual control Gain and Tube Drive enables a wide range of sounds from transparent and clear to edgy and overdriven. The compressor in the channel strip is a fully variable ultra-fast and smooth VCA-based circuit with all of the controls needed for a wide-range of compression settings: ratio, threshold, attack, release, and gain make up. The VCA-based compressor is known for musicality as well as ultra fast attack with the ability to tame the fastest transients. From slap bass, to snare drum, to vocals, the Studio Channel's compressor stage allows you to record as hot as needed without clipping giving you total dynamic control. The equalizer in the PreSonus Studio Channel is like a Swiss Army pocket knife, with the ability to carve out unwanted frequencies as well as tailor your tone to enhance your sound. The custom-designed amplifiers in the EQ deliver sweet-sounding gain/cut for ultra smooth highs, deep, solid lows, and clear midrange. The mid-band of the EQ section has variable Q for controlling the width around the center point of the selected frequency. High and low frequency bands give you the option for selecting peak/dip or shelving frequencies. Dimensions: 19W" x 1.75"H x 5.5D"